One of the most difficult meals to prepare in my household is breakfast. It seems as if there are so few options. Cereal, oatmeal or eggs, what would you like? Don’t get me wrong, I don’t have any issues with any of those things, but man can it get boring when it becomes routine. It also seems as if breakfast is carb heavy in order to give us energy early in the morning, but truth be told we should be looking to protein and vegetables to help in that department. Again, I’m not knocking carbs after all I’m Italian and was born with a slice of bread in my hands, but protein and veggies are much more sustaining and better for you in the long run. When it comes to making breakfast, you’ve got to be able to prepare it in 15 minutes or less, which is why I came up with an assortment of recipes for these Gourmet Breakfast Toast Recipes with Poached Eggs. There is no hour to get things prepped for feeding your family, unless of course you are in a nice restaurant preparing for guests. Nope, my family is hungry in the morning and they want food NOW! Regardless of any meal that I prepare, I always take a stroll down the dairy aisle where I almost always pick up a something new to try out. Whether it be whipped cream cheese, almond milk or brown eggs like these GMO-free Nature Fed Eggs, there is always something I can get to help enhance my recipes. We are a mostly organic natural food family which means we want to know how our food was cultivated or created, so we have an idea of what we are putting into our bodies. Nature Fed Eggs give me a lot of reassurance that their eggs are from chickens who are free range and eat what nature provides making it taste and look great. I hope I get a chance to tour their barn some day! As I said earlier, it’s important to get breakfast on the table quick, and these 5 Gourmet Breakfast Toast Recipes with Poached Eggs are all really easy to do and can be done in under 15 minutes total. While I recommend doing just 1 or 2 to serve up, you should definitely give all of them a try because they are really tasty. The first part of the toast recipes is of course, the toast. I used a variation of breads which include ciabatta, rye and sourdough, HOWEVER, this recipe can totally be changed up so please feel free to use whatever kind of artisan bread you’d like. In fact, even a homemade bread recipe would be fantastic with this! Simply slice and toast the bread in a toaster or in an oven on a broiler setting and then load it up with your desired toppings. Poaching eggs can be a little tricky because more often than not it turns into this crazy spider web of egg whites that go all over the place. 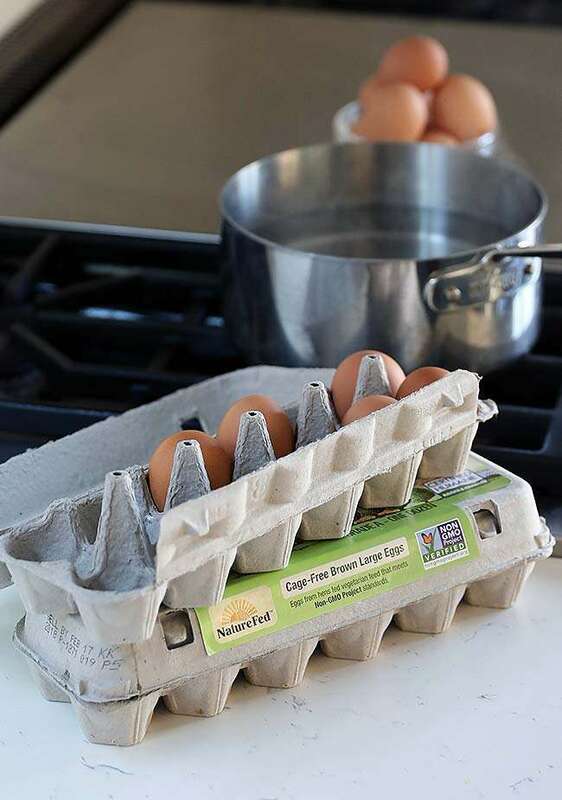 The trick to making it a smaller, more full egg is by stirring the water in a circular motion using a spoon and then putting the egg in it and letting the white wrap around the yolk. Be sure to only simmer the water over low heat as well as seasoning it with salt. The first toast I created was by spreading on a bit of ricotta to the toast and then adding on slices of avocado and topping off with some chia and sesame seeds. You can absolutely add more seeds such as poppy seeds, hemp heart seeds, etc. Last but not least top with the egg and serve! The second toast was a combo of cream cheese, smoked salmon, radishes, a poached egg and micro greens. Always remember to season with salt and pepper. The third toast was an Italian delight with roasted cherry tomatoes, burrata, a poached egg and fresh chopped basil. Yup, you guessed it, this one was my favorite. The fourth toast had sliced roasted beets, goat cheese, a poached egg and thyme. Super simple and absolutely loaded with flavor. The last toast was roasted mushrooms, a poached egg, parmesan cheese and a little truffle oil. This one was a really close second favorite! Our family is so busy in the morning time that often times it is so hard to get something delicious on the table that I know is good for everyone, so I came up with these tasty Gourmet Breakfast Toast Recipes with Poached Eggs that definitely satisfied everyone at that table! 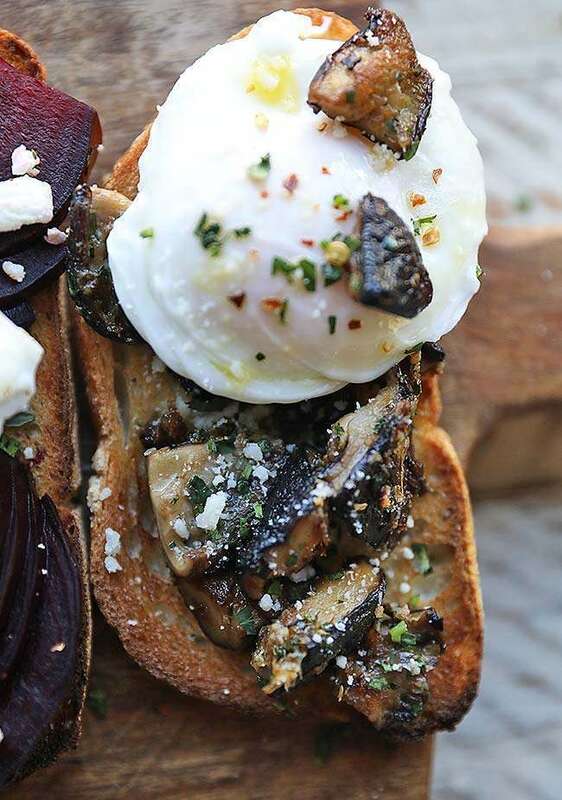 Mushroom Toast: Place the roasted mushrooms on the toast and top with a poached egg, chopped parsley, grated parmesan cheese, truffle oil, salt and pepper. Serve! Beet Toast: Place the sliced roasted beets on the toast and fan them out. Top off with a poached egg, thyme leaves, goat cheese and salt and pepper. Serve! Tomato Toast: Place the roasted tomatoes and burrata next to each other on the toast and top off with a poached egg, chopped basil, and salt and pepper. Serve! 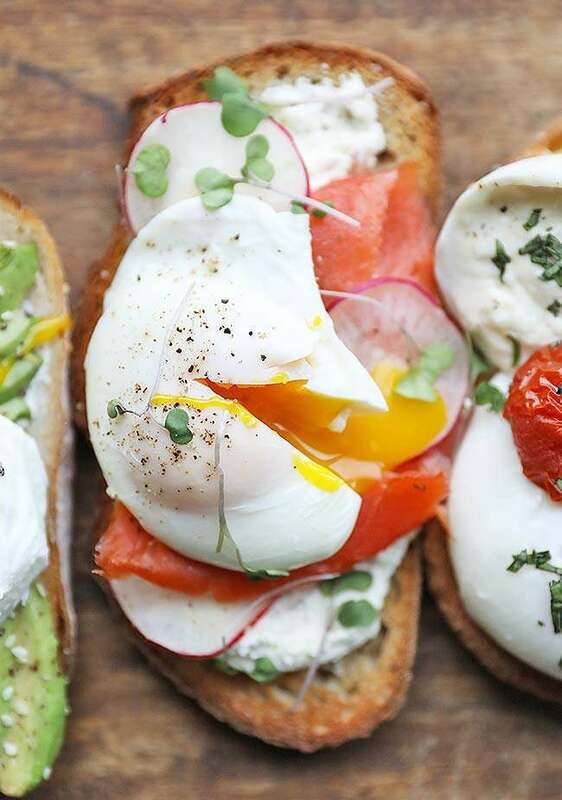 Smoked Salmon Toast: Spread the cream cheese on the toast and top with smoked salmon slices, sliced radishes, poached egg, micro greens, and salt and pepper. Serve! Avocado Toast: Spread the ricotta cheese onto the toast and fan the avocado slices over top. Place the poached egg over the avocado slices and sprinkle on the chia seeds, sesame seeds, salt and pepper. Serve!